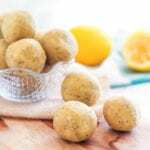 Light, luscious and zesty, these Coconut Lemon Poppyseed Protein Bites remind me of the lemon poppyseed muffins I used to love making as a kid. For an extra coconutty touch, roll them in coconut milk powder or desiccated coconut before serving. Whirl oats, coconut and cashews in a food processor until they resemble a coarse flour. Pour the mixture into a large bowl and stir in the protein powder and sea salt. Set aside. Pour the soak water off the dates. Pulse in the processor until pieces are as tiny as possible, pausing to scrape down the edges as needed. Add the honey, lemon juice, lemon zest, cashew butter and vanilla. Process into a smooth puree. Gradually add the dry mixture and blend, again scraping down the edges every so often. (Add a little water or lemon juice if the dough looks a little dry.) Finally, stir in the poppy seeds. Roll the dough into 12 balls. Store in the fridge/freezer.